Imagine the mashup of Hank Williams and Frank Sinatra. The result is powerhouse postmodern country with a driving beat. Hank Sinatra leads his band through the greatest hits of the 40’s and 50’s, bringing his unique style to every song. Hank’s band has the usual honky-tonk instrumentation of a twangy Telecaster, triple-neck steel guitar, drums and bass, but they take country into a whole new realm when they launch into a pop classic like “The Lady Is A Tramp”. 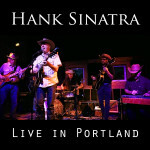 performance was recorded and then released in January 2016 as Hank Sinatra’s latest album, “Live in Portland.” The album features Hanks’s high-energy take on Americana classics, backed up by Portland’s best musicians for a listening experience that’s exciting and totally unique. In this video, Hank and his boys take country into a whole new realm when they launch into “The Lady Is a Tramp.” The entire album crackles with electricity, and the sound quality and performances are truly impressive. Click on this link to the album on CD Baby to listen to all tracks and instantly download. Check out the official Hank Sinatra channel on YouTube to view dozens of Hank’s performances. In June, Hank and his boys headlined Portland Monthly’s annual Country Brunch, entertaining 600 guests at the sellout event. Just the night before the Country Brunch, Hank opened for the national alt-country and rockabilly act Wayne “The Train” Hancock. Click here to visit our library of video and audio clips.